It’s impossible not to feel touched when you see men proudly holding their young kids. And this is especially true in the case of famous dads and their children. These guys look great whether they’re on the screen or on the stage, but they look at their most natural when we seem them performing their duties as authentic loving fathers. A professional football player, a star of advertising campaigns and the ultimate hunk, David Beckham, has always been an exemplary father. His three sons — Brooklyn, Romeo and Cruz — are already a bit older, whilst his long-awaited daughter, the little Harper, has become a real joy to her parents. ”If it was up to me, I would lock her on top of the tallest tower and I’d conduct a cross-examination of all the beautiful princes at the entrance,” David has said. Despite breaking up with his wife, the model Miranda Kerr, Orlando Bloom has maintained friendly relations with her and thankfully manages to spend lots of time with his son. It looks like this nice little boy will one day break a lot of girls’ hearts! The defender of Barcelona FC chose the beautiful singer Shakira as his wife, who has already given him two beautiful sons. It seems the family is serious about bringing up their own football team: the kids already go out on the pitch after the game and, of course, wear branded T-shirts of their dad’s club. The father of a large family, Brad Pitt always tries to spend as much time as possible with his children: he makes them breakfast, takes them to school and to clubs, and travels with them around the world. The actor has confessed several times that his children are the main thing in his life. Despite being busy around the clock and having to cope with the huge career leap from frivolous romcoms to serious, Oscar-winning dramas, Matthew McConaughey never puts his family — his wife Camilla Alves and their three children — to one side. He walks his kids to kindergarten, spends days-off together with them by the ocean, and shows them to the world. The degree of admiration for this celebrity dad is growing year on year. 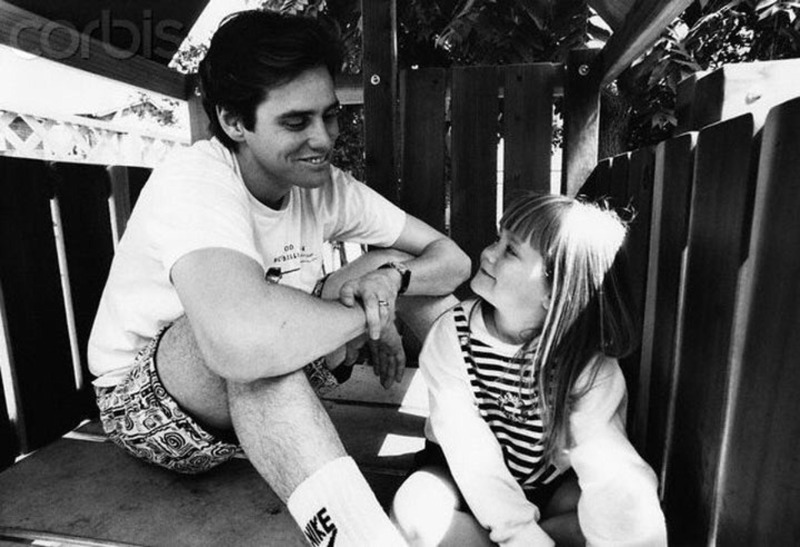 The talented actor Jim Carrey has always tried to be a good father to his only daughter, Jane, despite the fact that his relationship with her mother didn’t work out. This photo was taken long ago (1991), but nowadays, Kerry often attends the first-night premiers of his movies together with his grown-up daughter. Age is no obstacle for the Die Hard star: the actor’s fifth and youngest daughter was born when he was 59 years old! His three grown-up daughters were born when Willis was married to the actress Demi Moore, whilst he has had the younger two with his second wife, model Emma Heming. Chris Hemsworth, the Marvel Studios star, becomes a gentle and caring dad to a large family when he’s at home. “The most important thing I realised after having children is what love can be,” he says. American actor Cam Gigandet managed not only to land a role in the well-known Twilight series but also start a strong and beautiful family. Judging by the funny photos, his children have inherited his acting talent and will surely be able to follow in their dad’s footsteps. This baby really, REALLY loves his cat!